So what has this to do with hot rods? Well, I did not have a memorable mid-life crisis so I decided to have an old age life crisis to make up for it. This called for building one of the most unique and powerful Ford flathead engines ever built. Now in the colorful history of the Ford flathead engine, which was built from 1932 to 1986 or perhaps later, most everything was done to it that the mind of man can conceive. “Oh,” you say: “You dummy the flathead was built from 1932 to 1953 at which time Ford replaced it with the overhead valve Y block.” Quite true but production was continued in France for use in French army trucks. A warehouse full of these engines and components was dumped on the surplus market a number of years back. I went to College Station in Texas and bought several of the engine blocks and crankshafts for my own projects and to sell to customers. A block I used was cast in 1986. The old Ford flathead legends just never die and neither does the engine. So using my vast knowledge of flathead engine design and assembly I came up with a new idea. I had watched and helped my good friend Denis Blake assemble an engine in my shop so I figured that made me an expert who was ready to launch into areas previously unknown. I decided as my first engine build, I’d design and assemble a bored and stroked, ported and relieved, supercharged, multiport electronic fuel injected, crank triggered, coil on plug flathead Ford engine. Do you see some potential foolishness in that? Now I have no ambition for racing. Like Clint Eastwood said in his “Dirty Harry” movie: “A man has got to know his limitations.” But I do know electronics and had success in building a Weber style billet throttle body multi-port electronic FI system using a special manifold and riser set from Tony. 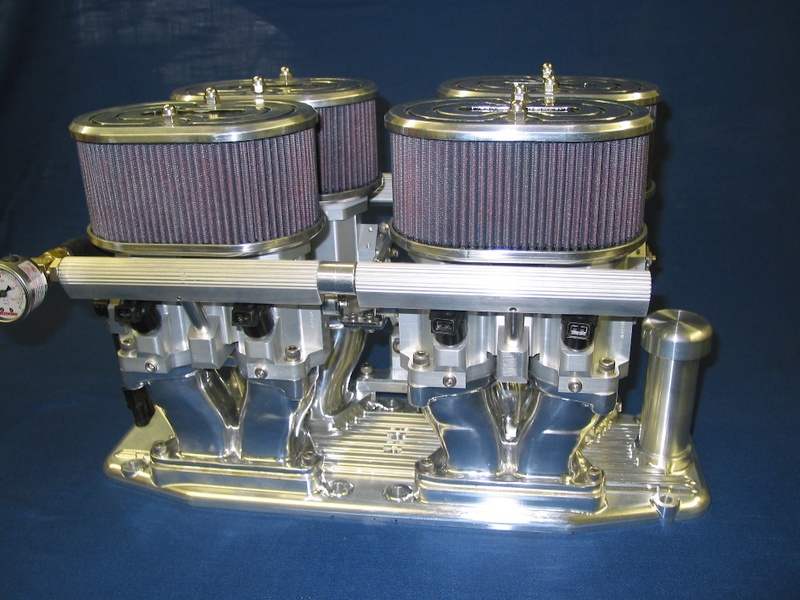 I equipped it with throttle bodies designed by John Cimbura and manufactured by his brother Dave. The injectors are controlled with an ECU supplied by Lance Nist of Pantera Specialties. It is a beautiful appearing and great performing system. 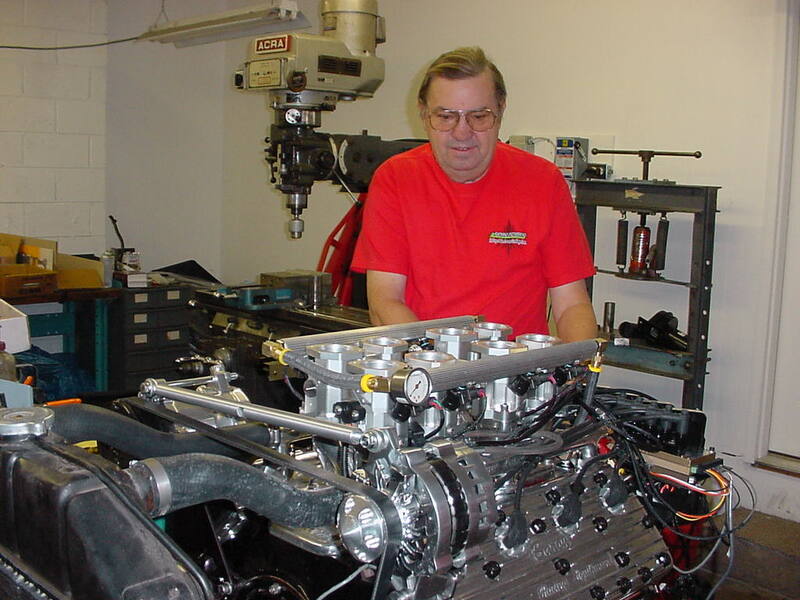 Tony, in his time away from his teaching position for Ford ASSET Training, assembles fabulous supercharged engines using the Magnuson modified Eaton supercharger for select clients. He took interest in my ambitious project and agreed to help me. This deescalated the project from “totally ridiculous” to “possible.” He clued me in to his special suppliers and supplied all the critical engine specifications. What remained for me was to figure how to put the parts together and make it run. The critical assembly that was required is the magnificent blower kit designed and manufactured by Tom Roberts in his one person company: Tom Roberts Design. Tony and Jerry Magnuson worked with Tom to make this a very successful exotic design. I was one of the first customers. I shipped my French block to LA where Tony’s guys machined the deck and bores and ported the intake and exhaust passages to optimize flow and thus increase horsepower. That left me to figure out how to make the adapters for the accessories including the crank mounted trigger wheel and the mounting for the individual spark plug modules. But first I had to assemble a short block engine. A “short block” is the engine block plus all the rotating assembly and valve train but no manifold or accessories. It was routine up to the point of installing the valves and valve springs. This is where the foolishness cut in. In a normal engine, the valve and the valve spring are assembled on the bench and slipped into a hole in the top of the block and a simple spring compressor tool is used to allow the installation of a keeper that holds the assembly in place. In this engine the valve springs are oversized and extra heavy duty to allow the engine to rev to a much higher RPM than can be sustained by a stock engine. The heavy duty springs prevent the dreaded phenomenon known as “valve float.” This is when the valve lifter flies off the cam shaft lobe and no longer follows the profile. Not good! It was necessary to put the valve thru the valve guide and install the oversize spring from inside the block. This required me to make a special spring compressor to do inside the block that which would normally be done on the bench. With the spring compressed and under great force it was necessary to install the split valve locks in the grove in the valve stem. You put one half of the lock in and it falls out when you try and put the other half on. Made several special tools none of which worked to do this job. You might try using your fingers but if the valve compressor slipped, which it occasionally did, you would pull your hand out minus the tip of your finger. Not good! The workable solution was too put grease on the tip of a long screwdriver and stick the lock to the screw driver using the grease and GENTLY put the keeper in the grove in the valve stem and try to keep it there when the screwdriver was removed. The procedure is repeated with the other half of the split lock which nine times out of ten dislodged the previously installed lock. Sixteen valves, thirty two locks and hours of patient effort was required to get all the retainers installed. Due to other fitting concerns I had to do this three times. Not good! All older engines use a mechanical distributor to fire the spark plugs at the proper time and in the proper order. This engine uses a 60 tooth timing wheel and a magnetic pickup that generates a pulse each time a tooth flies under it. So at five thousand rpm five thousand pulses are generated every second. Each pulse has to be counted and a missing pulse detected to establish that the number one piston is at top dead center. Then the ECU calculates the correct time and order to fire the spark plugs. It also calculates when to open each of the eight injectors and how long to open each one of them to deliver an exact volume of fuel to the combustion chamber. I designed the adapter that was required to mount the very critical trigger wheel to the crankshaft. My friend Dennis got on his old Monarch lathe and after several days effort machined a perfect adapter out of an aluminum billet. With that critical part in hand I could use my old school milling machine to make the remaining special parts. The assembled engine was put on my test stand. Very Good! 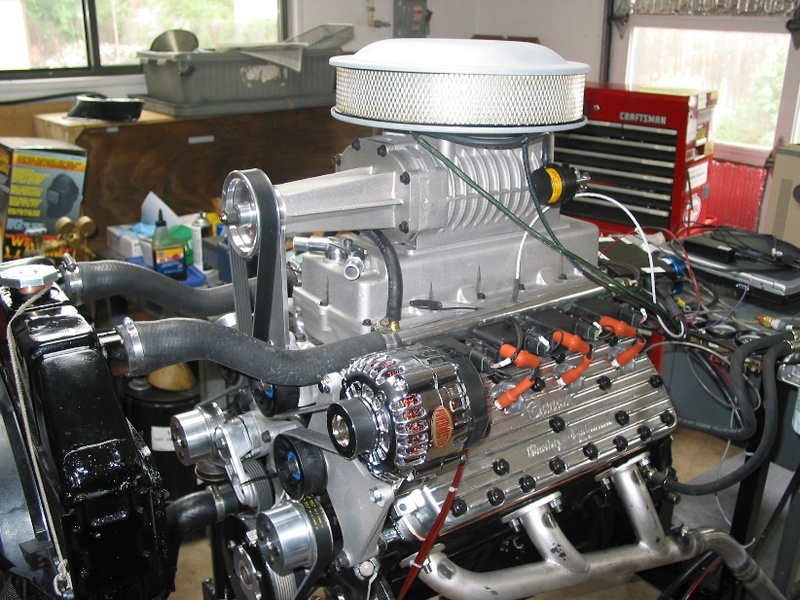 The assembled engine was run in on the test stand and installed in my 40 Ford coupe. Surprisingly it all fit under the hood. Not so surprising but very thrilling is its performance. The whine of the blower is such that when I accelerate down the block I do not have to sound the horn to get the kids out of the street. At the next Father’s Day LA Roadster show I was hanging out in Tony’s booth when Joe Abbin came by. If you are into flatheads you know about Joe and his superb books. So two professionals both experts on supercharged flathead engines got to meet each other. Joe wanted me to put the engine on his dyno to see how much horsepower it makes. However it would be too much effort to remove and reinstall the engine so the horsepower figure I quote is whatever lie I feel like telling. This is the way a lot of builders establish their power figures. It was fun to listen to Joe and Tony get into it on how to best build a racing flathead. One of the charms of being part of the flathead community is that you can present a problem to five different experts and get five different solutions each of which is the best one. So what did my foolishness gain me? Well I met some very fine people who pitched in to help me. Once again I confirmed that if you have a large worthwhile goal you will attract the attention of likeminded people who will help you succeed. I am finding this true in my literary effort. Not seen by the reader are some great professional support people that make a finished result possible. In later newsletters I will introduce you to them. As I grow older I have found that engines and transmissions have become heavier I think the principle of “Age Variable Gravitation (AVG)” is responsible. The basic effect is that the older you get the heavier things become. To counteract this phenomenon I have switched from building cars to writing action adventure books about cars that I have built. 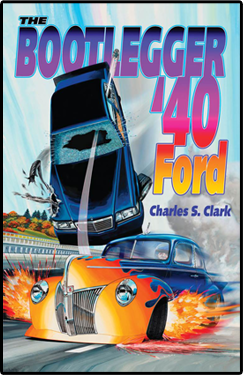 The “Bootlegger 40 Ford” is the first effort. Others will follow. So spread the word that there is a new gearhead in town, his name is Charles S. Clark, and I want to hear from you. This article was published in Bootlegger Book Blog and tagged 40 Ford, engine block, gearhead, hot rods.